This junk email just in, with a little inspriation for Mother’s Day. I can honestly say I would have never thought of this. Hey Mum, where do you want to go? Stansted is meant to be nice this time of year, but I heard they have a fantastic multi-story at Leeds-Bradford. If you listen carefully, you can hear the clinking of a single champagne glass. 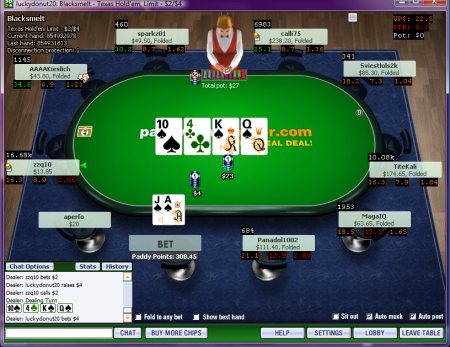 I’m finally done playing on Paddy Power Poker, and that’s cause for a mini-celebration. I actually quite like the iPoker software and there’s usually good game selection at the levels I play, but the problems is that I never really knew where I was with those games. Mixing and matching so many different limits probably didn’t help though. I was up and I was down and I was swinging all over the place. 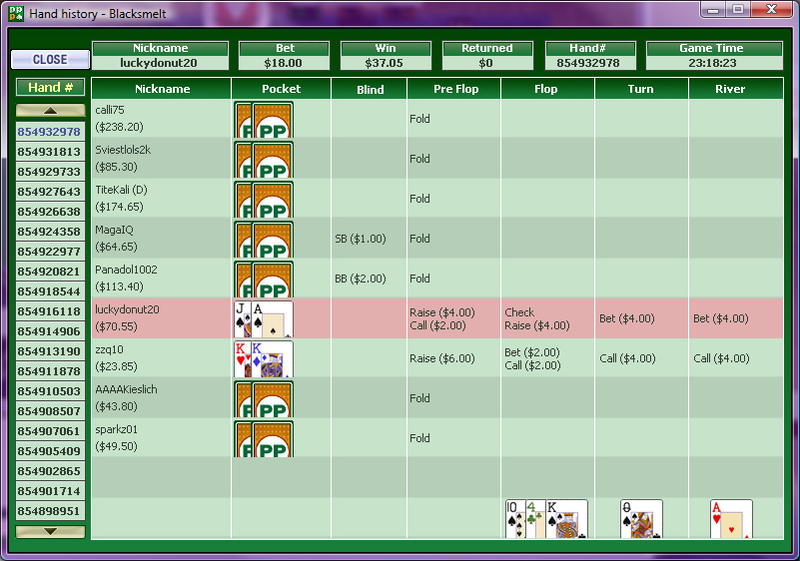 Every limit I played I was in the green for a while, and then it swung back in to the red and back up again. Some of them stayed there. While 23,662 hands is be a reasonable number to start seeing getting an idea of how I played, it’s not much use with only a few thousand hands on each of the fixed limit games. However, looking at the percentage of hands I played at $3/$6 compared to the other limits, I should probably re-evaluate whether I’m actually comfortable playing for those stakes. The only thing that kept me coming back was my data on the players at that level suggested they could often be much looser than the usual nits at $2/$4, and so I thought I was finding good spots. I just never really made them pay. The good news though – despite being a loser on paper, I’m still leaving the site with about a grand more than I came with, thanks to signup bonuses, monthly cash rewards, player point redemptions and a friendly affiliate referral. But boy was it hard work, and barely worth it. But now that I’ve used up all of the $600 sign up bonus and been left with a mountain to climb to get back into VIP status (their member level formula looks at the last 3 months activity, so I’d now have to over-compensate for a quiet January) and I’m moving on. At least I got a nice little hot streak to end it all with. These all happened within five minutes of each other (check out the timestamps on the screenshots!) and were part of a very welcome $200 upswing. Well, I can’t be sure it was actually the biggest I ever had but it felt like it, and the action was amazing. 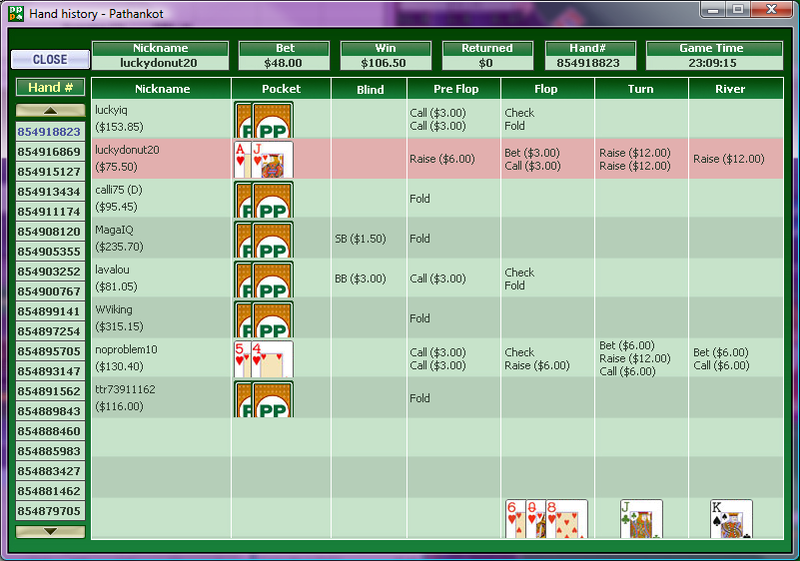 $65 is a 33 big bets pot, and I took it down with pocket kings which made a full house on a board of 556KQ. It was capped on every street except the flop, with the two other guys involved seeing something I obviously missed in their KQ and 99 hands. Click the thumbnail to see the full hand history. 2. Table selection paying off. I’d seen a particularly juicy-looking $3/$6 table but it took me an hour to get the right seat. I’m quite fussy about where I sit now. Playing fixed limit in particular, there’s so many good players that you have to try to sit as close to the immediate left of any mark you find to play the maximum number of hands against them in position. I’d had my eye on seats 6 and 9 who were both seeing over 40% of flops. 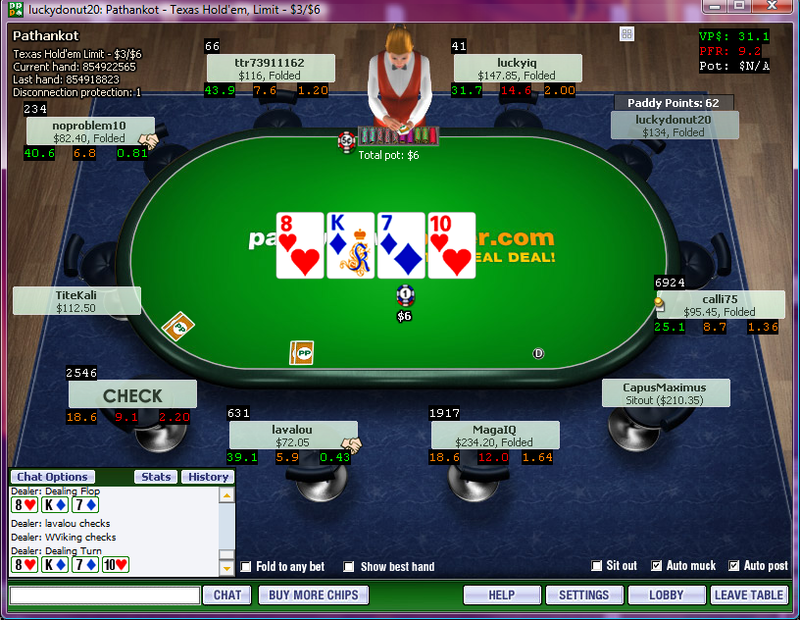 By the time I got into position in seat 2, two other seats had also been filled by fishy players. Click the table thumbnail to see what a good game should look like. 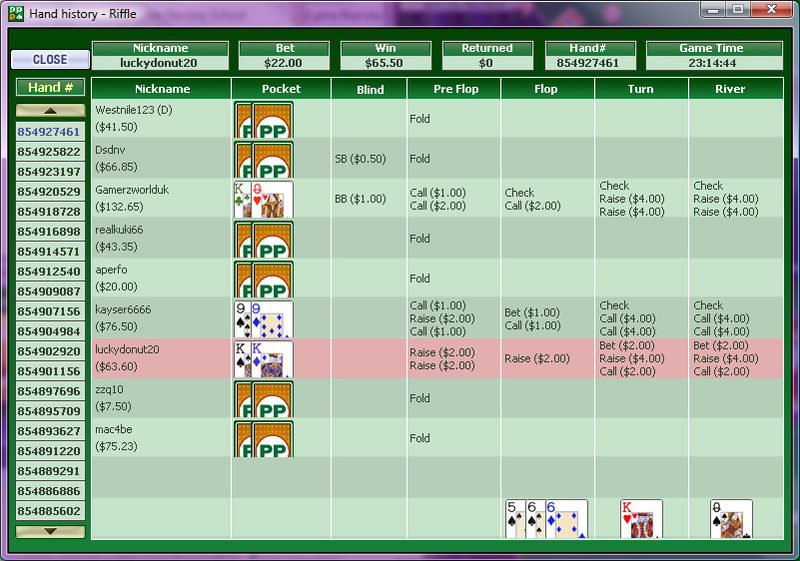 On iPoker, this almost never happens, and especially at this level. The first hand I got involved with was perfect. Mr Loose had limped in and I raised him with AJs. Everyone else got out of the way for a magic all-heart flop. He’d limped in out of position with two small hearts, I had two large ones and he paid me off very nicely thankyou. It’s only seven months since my last one, but this always deserves a picture. I got called to the river by pocket kings, which had flopped a set but got scared by the possibly flush and straight options. Shame the board didn’t pair on the river, really. The message to Las Vegas bargain hunters is clear: fire is good. After the blaze on the roof of the Monte Carlo last month, the hotel is re-opening on Friday and has slashed room rates as low as $70 until June to try to fill up the hotel. The deal also includes $25 dining credit, $10 slot play and $5 for Starbucks into the bargain. I’ve just booked a $70 room for the first two nights of my upcoming trip. It’s still better value than anything I can get from Harrah’s with my Diamond card, apart from Imperial Palace. The next closest competition was Bally’s for $75/night, and that’s without the extra freebies you get at Monte Carlo. I will get to use Total Rewards for a night at Harrah’s Laughlin though at least. I discovered that even though the rate calendar shows $31/night or whatever, if I actually click some dates to book it then it suddenly turns into a comp. I could book up to five nights at a time for free, it’s just a shame that I can’t ever see us wanting to stay there for that long in one trip. I had the run of the hotel too; a choice of classic, luxury or premium room in either of the towers. The only differences I could see were a choice between flat screen TV or a view of the river. I went with the view. The rest of the trip looks like it will be taken care of using comps from Terrible’s (2 nights free) and Four Queens (3 nights free + 1 @ $35). T-38! "There might be bluff, there might be fluff, here at Premier League poker". Just one of the dozens of random soundbites that Jesse May has been coming out with for the tape while we waited for this evening’s heat to begin. One of the perks of reporting on a televised poker tournament is being able to see all the bits that don’t make it to the final show. 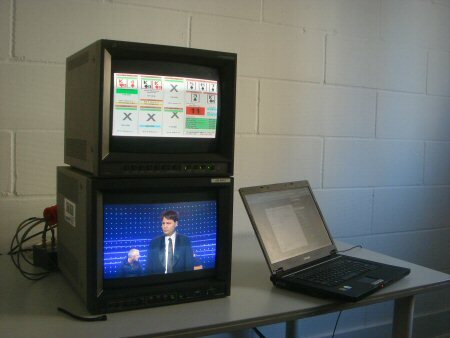 What I’d do right now for a capture card in my laptop and a sly cable into the live video feed. Earlier, May introduced Phil Hellmuth as "eleven time WSOP champion" and the pair recorded a punditry piece about the upcoming game. We don’t get to hear what is happening on the other end of May’s earpiece, but clearly the Powers That Be weren’t quite happy with it, so they had to go again. But first, Hellmuth had a request. "If you’re going to say ‘eleven’, say ‘record’ baby. I worked hard for that record". Who on earth is powerful enough to argue with that? They began again. "I am joined this evening by … err … record … err". 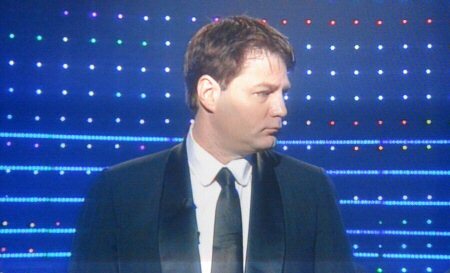 It’s the first time I’ve seen the Voice of Poker lost for words, but he quickly reaffirmed his legendary status. He laughed it off for about half a second, put his game face back on and nailed it the second time. Anyone got a copy of Pro Blogging for Dummies? Can you believe someone is actually paying me to blog for a week? Not only that, but a good chunk of the time I’ll be required to pay very close attention to Vicky Coren’s stack. I’ve joined the reporting team at PokerNews.com and will be posting hand-for-hand updates on the Party Poker Premier League from a cell block in East London. Turns out the rumours were true – Cher is on her way to Caesars Palace. It’s almost official! Word has already made it to the local Las Vegas news channels and you can expect the Harrah’s marketing machine to start bringing the hype pretty soon. Soon Cher’s face will be on the Caesars marquee sign, all over their casino chips and on her own tacky portrait over the casino entrance. Same surely goes for Bette Midler, who starts performing there later this month. Seems a safe bet to assume that Elton John will not be renewing his contract again when it expires later this year. But Cher and Bette can’t have it all just yet. You have to join the ranks of the Caesars alumni before some of the really great stuff is made in your honour. Just so you don’t go forgetting about Celine Dion just, there’s some fabulous souveniers up for grabs, including an actual piece of the stage from the Colosseum (Elton and Seinfeld obviously bring their own) for a how-can-you-refuse price of just $149. Or what about this fabulous collectors’ piece? The price for two ticket stubs and six red chips is a mere $249. Calling it a scrapbook really is doing it a disservice – it’s a lovely frame, you have to admit. What you really want though is a souvenier you can drink, and thankfully there’s someone waiting to cash in on that urge. In fact this is brand new this week, according to the spam I just got. 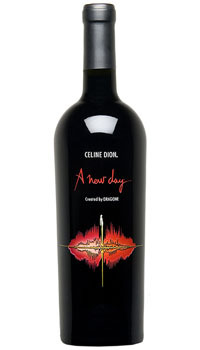 You can finally spend $90 on a bottle of official "Celine Dion – A New Day" wine. Just two months after the 5-year show ended. It’s such a shame none of these won’t ship internationally. Otherwise I’d need another excuse. I just got a response from Harrah’s Total Rewards in response to a question I asked about why I don’t yet have any good Las Vegas offers since I became Diamond. I can get a fully comped room at almost any other Harrah’s location for up to 3 nights. In Atlantic City, I can choose between Bally’s, Showboat and Caesars and not pay a penny. Harrah’s resort in Tahoe or Reno – also gratis. Anyone know where Tunica actually is? The Horseshoe (one that Harrah’s apparently wanted for more than just to chew up and spit out everything except the name of a poker tournament), Sheraton and Grand Casino Resort all want me to spend a few nights there on the house. The normal rate for these rooms is $80-$120 per night. Should I really get excited about saving $5/night at IP, or $4/night at Paris? It’s a slightly better $9 discount at Bally’s, $10 at Rio and Harrah’s and a whopping $20 on the luxury rooms at Caesars. The Flamingo "GO" rooms have the best savings – up to $45 on some dates – but I’m just not the kind of person who goes for these fancy three-figure hotel rooms Maybe on a weekend, if there’s absolutely nothing else available… after tax. Thank you so much for your reply. It is my pleasure to assist you with your account/offer questions. Please allow me a minute to explain how our offers and the Total Reward program works. Offers are sent based on tracked play in the last 12-15 months at the specific property or pod (2 or more properties in the same area), rather then tier score. Offers generally take up to 6 weeks after a visit to be generated. Also, because Las Vegas is such a highly sought after vacation destination, we require a slightly elevated level of play for one to qualify for offers compared to some of our other properties across the nation (i.e., Atlantic City) this will also hold true for the different properties as each will have a set criteria needed in order to receive an offer for that property. Please keep mind that although you may not have an offer for the Vegas area at this time, you may still qualify for discounted rates, based on your overall play. I would encourage you to contact our reservation experts at 866-583-2608 for further assistance with rates. Mr. Newman, I hope that you will find this information helpful to your increased understanding of our Marketing system. If you have any further questions, or if we can assist you in any way please do not hesitate to contact us. Thank you for choosing the one-of-a-kind Imperial Palace! Although I can understand the logic behind not letting me exploit the system by playing the much better games in Laughlin and then staying in Las Vegas for free, it’s still is a little bizarre. Firstly, I agree the Imperial Palace is one-of-a-kind, but I didn’t chose it. It didn’t even chose me this time. 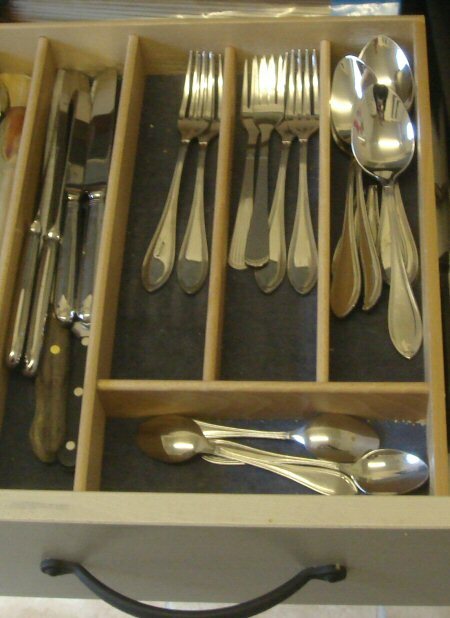 In fact I’ve never played anything other than poker (and a few blackjack matchplays) there. I didn’t even play poker at Imperial Palace once at Christmas. So presumably without any Las Vegas action on my card to associate me with a property, by default I end up at the place they want to demolish most of all. Secondly, I played an awful lot at Harrah’s Laughlin to get Diamond in a Day. It’s not quite six weeks yet, but if $30,000 coin in doesn’t trigger a mailer from there I can’t imagine what will. This is also the cheapest hotel in Harrah’s fleet by some way, clocking in at $36/night if you walk in off the street. My extra special Diamond rate is a pathetic $31. In his show The System, which aired on Channel 4 on Friday night, Derren Brown showed that winning (or, by implication, losing) ten coinflips in a row is quite a normal occurrence and really nothing to get excited about. If you haven’t seen it and don’t want me to spoil the surprise, go watch the full thing on YouTube. The show centered on a system for winning at horse racing, except in fact it wasn’t a system at all. The woman featured in the show was the "winner" of a elaborate brute force attempt to whittle a starting field of over seven thousand runners down to one person who had inevitably backed five winners in a row. Brown’s crew had sent out every possible permutation of tips across five six-horse races to find the one unlikely winner, removing anyone with a losing bet from the pool after each race. 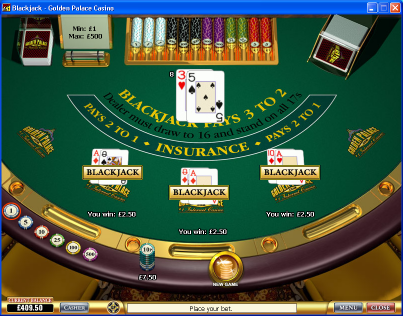 The number of participants required to do and produce one guaranteed winner is six times six times six times six times six, a total of 7,776. The ten heads video is apparently just a small clip from a nine hour flipathon, although because it’s Derren Brown I’m just not sure whether to really believe this. Don’t rule out some some magic coin shenanigans here, although the point he’s making is definitely valid: anything can happen, and it will happen eventually. Here’s an example I made earlier. Am I the luckiest blackjack player in the world because I got dealt this almost-impossible great trio of hands? It should happen roughly every 85,000 deals. I’ve lost count, but I must have played at least that number in the past six months, so it was bound to happen eventually. The nine hour filming session suggest that their experiment ran a little behind expectation, although not too badly. Because the outcome is not guaranteed, variance needed to go in their favour to make sure this shoot didn’t last several days! A streak of ten heads should appear once every 1024 flips. One flip every ten seconds would be just over 3000 over 9 hours, but you have to figure the actual number would be much less than that, allowing for enough breaks to avoid insanity. He probably tossed the coin 1500-2000 times. Derren declinesd to mention whether or not they also experienced an equally likely streak of ten tails during this trial, and if so whether it put him and the crew on lifetilt. I expect it would do.